1-0 2-0 Carli Lloyd 3' 5'; 3-0 Lauren Holiday 14'; 4-0 Carli Lloyd 16'; 4-1 Yuki Ogimi 27'; 4-2 Julie Johnston 52'OG; 5-2 Tobin Heath 54'; Attendance: 53,000. Referee: Kateryna Monzul (Ukraine). same final as World Ladies 2011 and Olympic Women 2012.
after extra time. 1-0 Fara Williams 108'pen; Attendance: 21,483. Referee: Ri Hyang-ok (South Korea). 1-0 Carli Lloyd 69'pen. ; 2-0 Kelley O'Hara 84'; Attendance: 51,176. Referee: Teodora Albon (Romania). 1-0 Aya Mayama 33'pen. ; 1-1 Fara Williams 40'; 2-1 Laura Bassett 90+2'OG; Attendance: 31,467. Referee: Anna-Marie Keighley (New Zealand). penalties: 5-4; 0-1 Loisa Necib 64'; 1-1 Ceila Sasic 84'pen. ; Attendance: 24,859. Referee: Carol Chenard (Canada). France: Gaetane Thiney, Camille Abily, Louisa Necib, Wendie Renard, Claire Lavogez. 1-0 Carli Lloyd 51'; Attendance: 24,141. Referee: Carina Vitulano (Italy). 1-0 Mana Iwabuchi 87'; Attendance: 19,814. Referee: Kateryna Monzul (Ukraine). 1-0 Jodie Taylor 12'; 2-0 Lucy Bronze 14'; 2-1 Christine Sinclair 42'; Attendance: 54,027. Referee: Claudia Umpierrez (Uruguay). 1-0 Anja Mittag 24'; 2-0 3-0 Celia Sasic 36'pen. 79'; 3-1 Linda Sembrandt 82'; 4-1 Dzenifer Marozsan 88'; Attendance: 22,486. Referee: Ri Hyang-ok (South Korea). Best 3 European teams - qualify to Rio Olympic Games 2016. Germany and France qualified. Netherlands, Norway, Sweden and Switzerland paly-off for 3rd spot. England is not eligible. 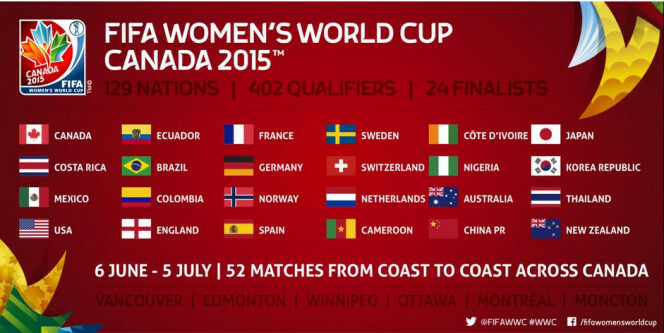 _ Europe Ladies_WCQ_2015: Germany, Sweden, Norway, France, England, Spain, Netherlands, Switzerland. 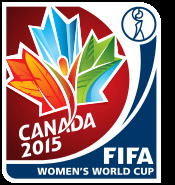 _ Concacaf Ladies_CONCACAF_Championship 2014 (3+1): United States, Costa Rica, Mexico. 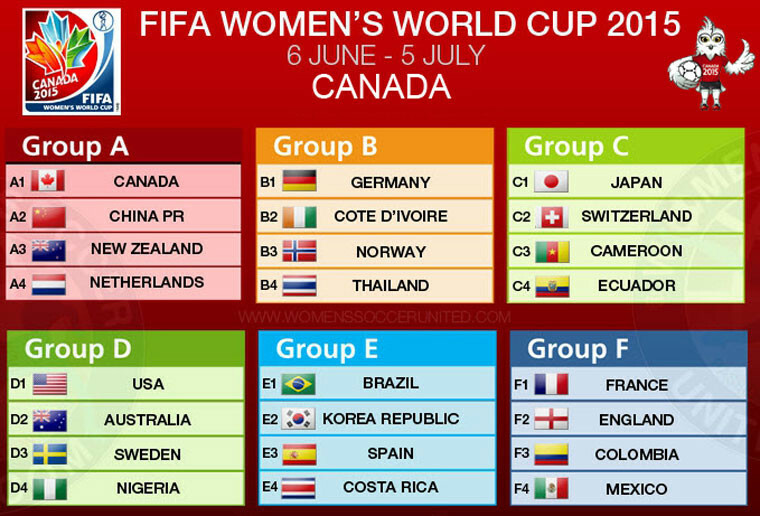 _ South America Ladies Copa America 2014 (3): Brazil, Colombia, Ecuador. _ Asia Ladies Asia Cup 2014 (5): Japan (1. ), Australia (2. ), China (3. ), South Korea (4. ), Thailand (5.). _ Africa Ladies Africa Championship 2014 (3): Africa: Nigeria (1. ), Cameroon (2. ), Ivory Coast (3.). _ Oceania Ladies Oceania Cup 2014 (1): Oceania: New Zealand (1.). First 2 and 4 best 3rd places progress to 1/8 Finals. 3rd placed: Colombia 4 4:3, Netherlands 4 2:2, Switzerland 3 11:4, Sweden 3 4:4, Thailand 3 3:10, Costa Rica 2 3:4. Attendance: 18,987. 0-1 Ange Nguessan 4'; 1-1 2-1 Orathai Stimanee 26' 45'; 3-1 Thanatta Chawong 76'; 3-2 Josee Nahi 88'; Attendance: 18,897. Referee: Margaret Domka (United States). 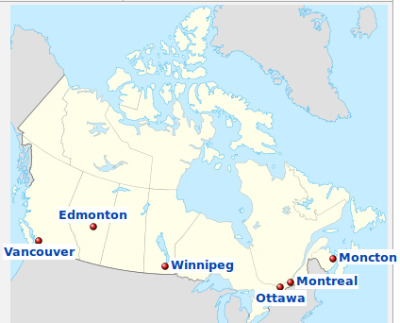 played at BC Place, Vancouver. Attendance: 25,942. 1-0 Madeleine Ngono Mani 34'; 2-0 Gaelle Enganamouit 36'; 3-0 Christine Manie 44'pen. ; 4-0 Gaelle Enganamouit 73'; 5-0 Gabrielle Onguene 79'pen. ; 6-0 Gaelle Enganamouit 90+3'pen; Attendace: 25,942. Referee: Katalin Kulcsar (Hungary). Attendance: 25,942. 1-0 Aya Miyama 29'pen. ; Attendace: 25,942. Referee: Lucila Venegas (Mexico). Attendance: 31,441. 1-0 Angie Ponce 24'OG; 2-0 Eseosa Aigbogun 45'; 3-0 4-0 5-0 Fabienne Humm 47' 49' 52'; 6-0 7-0 Ramona Bachmann 60'pen. 61'; 7-1 Angoe Pince 64'pen. ; 8-1 Angie Ponce 71'OG; 9-1 Martina Moser 76'; 10-1 Ramona Bachmann 82'; Attendance: 31,441. Referee: Rita Ganu (Malaysia). Attendance: 31,441. 1-0 Aya Sameshima 6'; 2-0 Yuika Sugasawa 17'; 2-1 Ajara Nchout 90'; Attendance: 31,441. Referee: Pernilla Larsson (Sweden). 0-1 Ana Maria Crnogorxevic 24'; 1-1 Gabrielle Onguene 47'; 2-1 Madeleine Ngono Mani 62'; Attendace: 10,177. Referee: Claudia Umpierrez (Uruguay). 1-0 Yuki Nagasato 5'; Attendace: 14,522. Referee: Melissa Borjas (Honduras). Attendance: 31,148. 1-0 Desire Oparanozie 21'OG; 2-0 Nilla Fischer 31'; 2-1 Ngozi Okobi 50'; 2-2 Asisat Oshoala 53'; 3-2 Linda Sembrant 60'; 3-3 Francisca Ordega 87'; Attendace: 31,148. Referee: Ri Hyang-ok (North Korea). Attendance: 31,148. 1-0 Megan Rapinoe 12'; 1-1 Lisa De Vanna 27'; 2-1 Christen Press 61'; 3-1 Megan Rapinoe 78'; Attendace: 31,148. Referee: Claudia Umpierrez (Uruguay). Attendance: 31,148. Referee: Claudia Umpierrez (Uruguay). Attendance: 32,716. 1-0 2-0 Kyah Simon 29' 69'; Attendance: 32,716. Referee: Dtephanie Frappart (France). 1-0 Abby Wambach 45'; RC: Sarah Nnodim (NGR) 69'; Attendace: 52,193. Referee: Kateryna Monzul (Ukraine). 1-0 Lisa de Vanna 5'; 1-1 Sofia Jakobsson 15'; Attendace: 10,177. Referee: Lucia Venegas (Mexico). 1-0 Maria Victoria Losada 13'; 1-1 Raquel Rodriguez 14'; Attendance: 10,175. Referee: Salome di Lorio (Argentina). 1-0 Formiga 33'; 1-1 Marta 53'pen. ; Attendance: 10,175. Referee: Esther Staubli (Switzerland). 1-0 Andressa Alves da Silva 44'; Attendance: 28,623. Referee: Carol Chenard (Canada). 0-1 Melissa Herrera 17'; 1-1 Ji Soyun 21'pen. ; 2-1 Jeon Gaeul 25'; 2-2 Karla Villalobos 89'; Attendance: 28,623. Referee: Michelle O'Neill (Ireland). 0-1 Veronica Boquete 29'; 1-1 So-Hyun Cho 53'; 2-1 Soo-Yun Kim 78'; Attendace: 21,562. Referee: Anna-Marie Keighley (New Zealand). 1-0 Eugenie le Sommer 29'; Attendace: 11,686. Referee: Efthalia Mitsi (Greece). 0-1 Veronica Perez 36'; 1-1 Faniela Monyoya 82'; Attendance: 11,686. Referee: Therese Neguel (Cameroon). 1-0 Lady Andrade 19'; 2-0 Catalina Usme 90+3'; Attendance: 13,138. Referee: Qin Liang (China). 1-0 Fran Kirby 71'; 2-0 Karen Carney 82'; 2-1 Fabiola Ibarra 90+1'; Attendance: 13,138. Referee: Anna-Marie Keighley (New Zealand). 1-0 Marie-Laure Delie 1'; 2-0 Jennifer Ruzi 0'OG; 3-0 4-0 Eugene le Sommer 13' 36'; 5-0 Amandine Henry 80'; Attendace: 21,562. Referee: Sachiko Yamagashi (Japan). 1-0 Karen Carney 15'; 2-0 Fara Wulliams 38'pen. ; 2-1 Lady Andrade 90+4'; Attendace: 13,862. Referee: Carol Chenard (Canada).